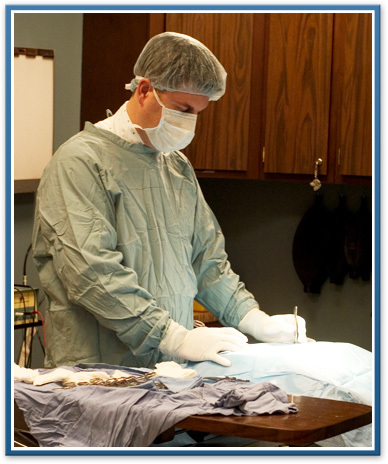 Ypsilanti Animal Clinic provides surgical services using state of the art monitoring equipment and the latest in anesthetic techniques. Pre and post-operative care is just as important as the surgical procedure itself and our highly trained veterinary staff focuses on complete patient care. Part of our pre-operative, intra-operative and post-operative anesthetic and medical protocol, all surgical patients including those undergoing routine procedures receive pain control medications. Since your pet is unable to voice his/her discomfort, our highly trained veterinarians and veterinary staff are able to recognize signs of pain in each patient. Our goal is to make each procedure as painless as possible. With more difficult and complex surgeries, proper pain management is imperative in helping your pet recovery comfortably and quickly. With your pet's health and well being in mind, pain management is a top priority in every surgical procedure we perform. In addition to saving lives, spaying and neutering can also drastically improve your pet's health and life expectancy. We are proud to offer these services at a low-cost fee. Dog Neuter < 50 lbs. Dog Neuter > 100 lbs. Dog Spay < 50 lbs.